FULLY CATERED in summer. This luxury chalet is located right in the centre of Samoens town. Chalet Samoens is perfectly situated to allow you to explore the beautiful medieval town and the surrounding Grand Massif mountain range. Chalet Samoens offers the perfect base for your alpine summer holiday, whether enjoying our yoga or self-guided walking holidays, or just our fully catered accommodation. Chalet Samoens is located in, yes you guessed it, Samoens, part of Le Grand Massif ski area. The catered chalet is situated in the centre of town and has all the delicatessens, boulangeries, and boutique shops right on it’s doorstep. During the summer the Grand Massif Express cable car is open which allows you to access some of the best high altitude walking in the French Alps, along with a huge variety of mountain bike trails. The catered chalet can sleep up to 17 people. Chalet Samoens has 6 ensuite bedrooms. Ensuites 3 and 4 have balconies with south facing views along with 2 extra single beds required. These rooms are excellent for families or groups of friends. 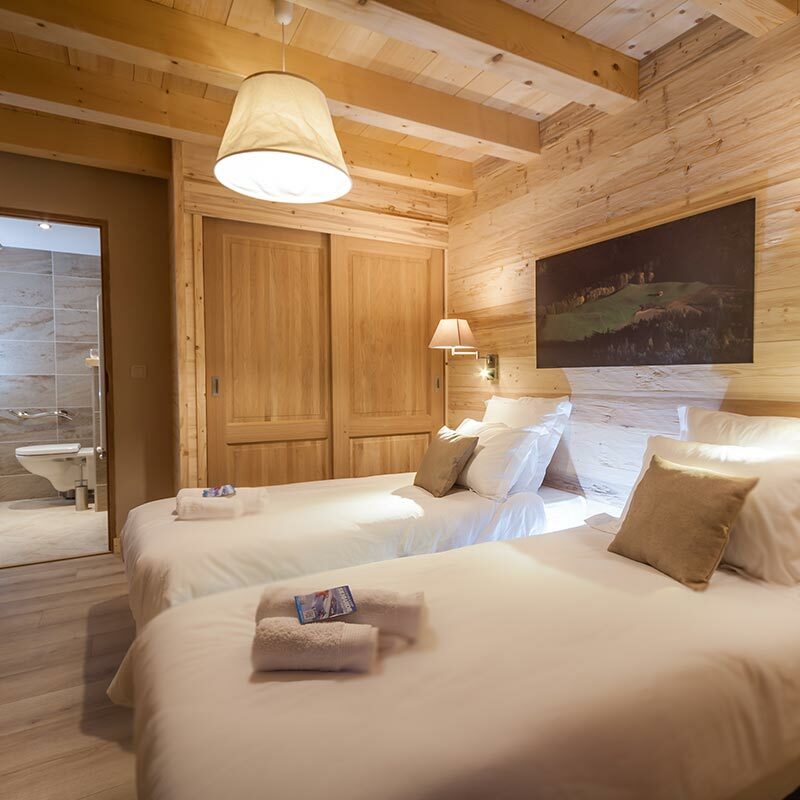 All the bedrooms at Chalet Samoens can be configured as either Twins or Super King Size Doubles, and each bedroom has a flat screen TV with English FreeView. All bathrooms have a nice range of Cole and Lewis toiletries, including shampoo, conditioner and shower gel. The property has a large open plan living room. It is south facing with large windows which allow lots of natural light into the chalet, particularly during the afternoon and early evenings. Guests can enjoy a pre-dinner drink on the balcony outside the living area or relax in the living area when canapés are served. One of the best features of Chalet Samoens is the large wet room with hot tub and sauna. Guests love to have a soak in the hot tub before dinner with a drink in hand after a long day in the mountains, and if stairs prove too much then have no fear, Chalet Samoens comes with it’s own private elevator! 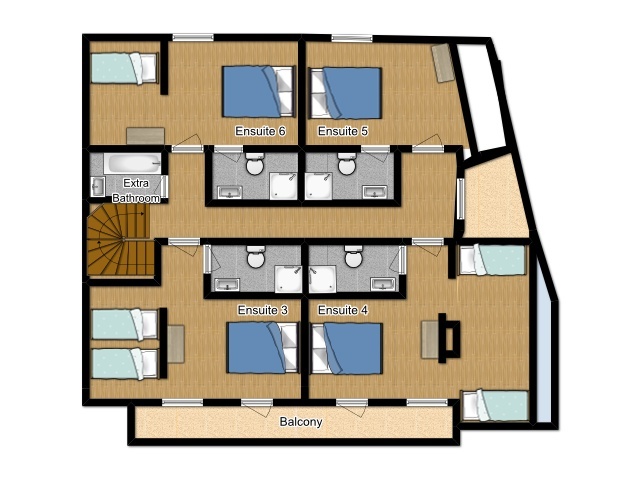 Ensuites 3 and 4 have a shared balcony with a small table and chairs for each bedroom. There is an additional charge of £50 per person for these bedrooms. Children aged 12 and under receive a 10% discount. Everyone who shares a room between 3 people receive a 10% discount. Guests that take exclusive occupancy with 13 or more people will receive 1 free space. So for a group of 13 you would effectively be paying for 12 spaces. Our yoga prices include fully catered accommodation and our full Yoga Package. Please click here for more details. Our yoga sessions take place at Ferme St Christophe - the property is a 15 minute walk from Chalet Samoens. We also provide a driver service to and from each yoga session if preferred. Chalet Samoens is located in the centre of Samoens town. The free ski bus that runs throughout the day directly to the Grand Massif Express is 150 metres away from Chalet Samoens. As the chalet is situated in the middle of town all of the local amenities, bars and restaurants are within walking distance.